We’ve rented an apartment in the Marais district. It’s the 1st floor apartment over the flower shop in the photo to the left. In the 1600’s, it got a royal uplifting when Henri IV built the Royal Place des Vosges. Later on, everyone, including the royals moved out of the Marais and by the 20th century, it was considered the slums of Paris. 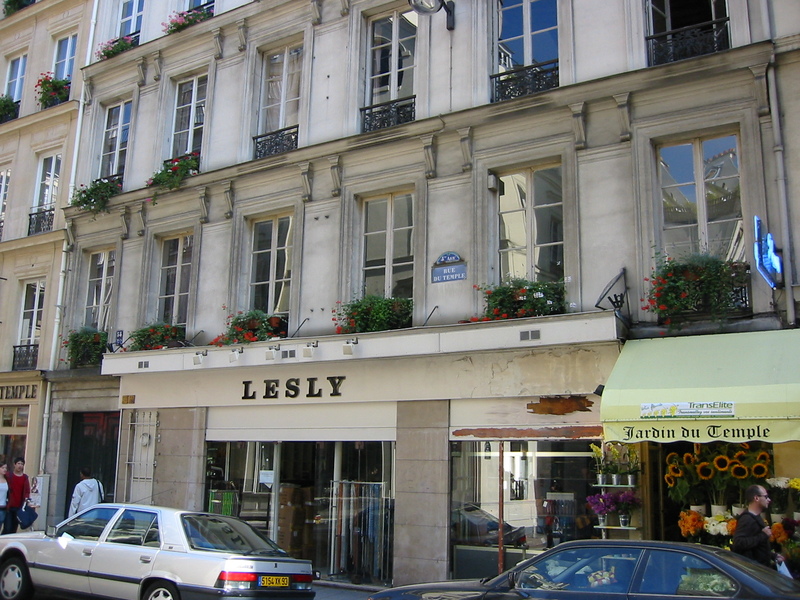 In the 1970’s, urban renewal built Les Halles and the Pompidou Center nearby and as artists looked for more affordable housing, the Marais became very trendy. It has retained much of its 17th century charm. While the rest of Paris is full of grand boulevards and magnificent Beaux Arts mansions, the Marais is a labyrinth of small winding streets full of brasseries, galleries and architectural treasures. From the living room window I can see the enormous blue ducts of the Pompidou Center stretching across the skyline like octopus tentacles crushing the steel superstructure. The Pompidou Center has never been one of my favorite buildings in Paris. Richard Rogers is a great architect, but this gigantic ant farm of tubes and steel just doesn’t fit in the old neighborhood. Nearby, a vibrant stream of restaurants, leather shops, food shops and gay clubs echo the sound of the Marais. On the Rue Rossier, the heart and arteries of old Jewish quarter, families of orthodox jews in traditional long coats, brim hats, and curled sideburns, frequent the kosher restaurants, butchers and religious markets, but everything else around them has changed to the lifestyle of the newer residents. Still, the Marais retains a small, neighborhood feel. It is a lot like staying in the village in New York. We really like it here. Most cities close up on Sunday. But Sundays in Paris are for Parisians. Main streets are closed to traffic and pedestrians walk arm in arm across the bridges and avenues along the river. 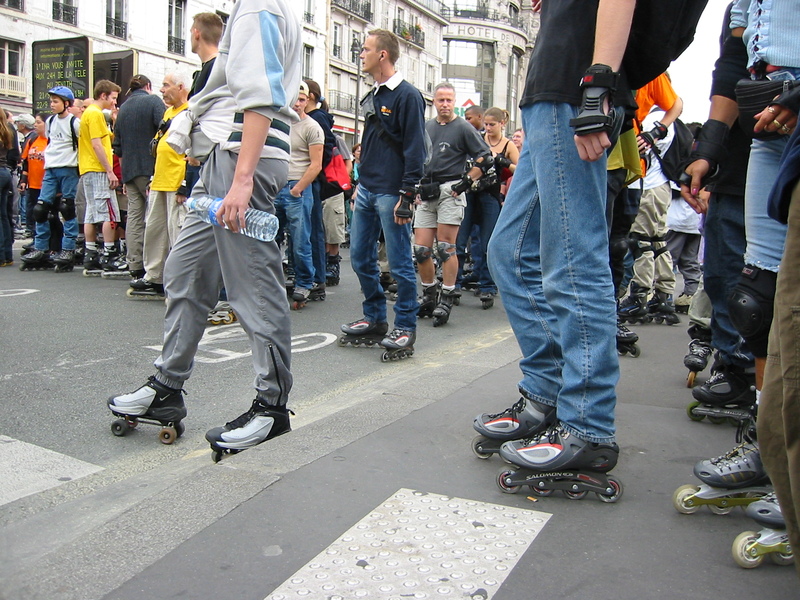 The Rue Rivoli to the Pont Neuf and over to the Boulevard Saint Michel was reserved for the parade of skaters, thousands of them on every kind of roller blade and roller skate imaginable; children, teenagers, elderly…. all on skates. And if that wasn’t enough, as the city ambulance mopped up the rear, the parade was followed by an ad-hoc group of bicyclists. As we approached the Notre Dame, we had no choice but to watch them all go by. There was no other way to cross the street. The galleries of Paris on Sunday are brimming with locals and tourists alike. 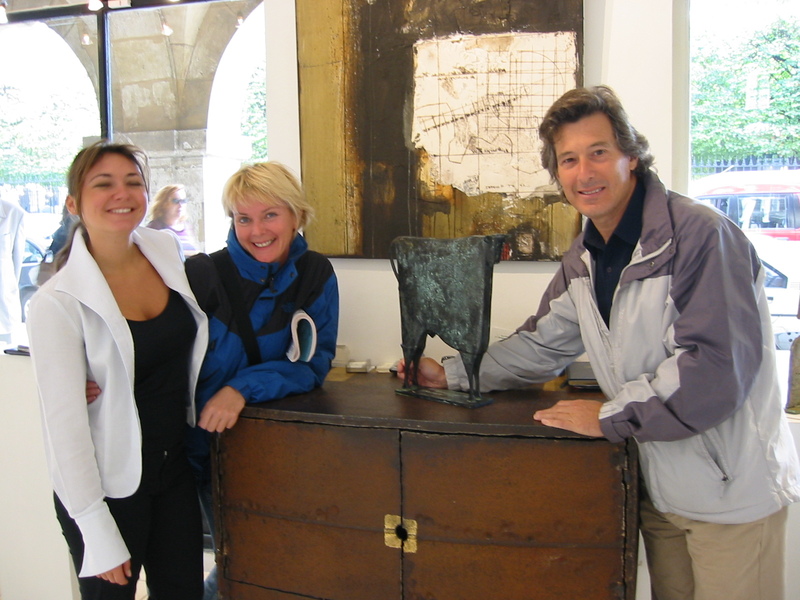 We’ve always enjoyed the galleries along the Place de Vosges. Maybe it was the day, maybe it was Paris. Maybe the contemporary bull sculpture reminded us of all we’ve seen in the past few weeks; the pre-historical bison of Spain and France, the statue of Mithras killing the sacred bull in Rome, Picasso’s alter-ego. This Carlos Mata bronze summed up much of our adventure into one really interesting piece and still reminds us of a wonderful day in the Marais. As we left the gallery, a male soprano echoed his favorite arias off the archways along the Place des Vosges. This was the same male soprano we saw here four years ago (or more). The only difference is that now he is a few years older and as he sings, he sells his CDs. We used to call him the castrato but since he now has a beard, I guess there goes that theory. 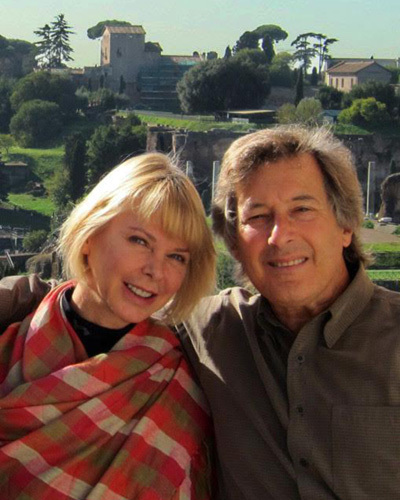 Sure, this is one of the best Gallery/Museum cities in the world; so much to do and see. But we’ve been spending most of our time looking for an apartment; an income property that we can buy, rent out and stay in a few weeks a year (or more). We seem to never tire of this city. Owning property in Paris means we could stay here for a few weeks and then go off to Italy by train or car. According to our new friend and rental agent Glenn, owning an apartment in Paris means we could easily rent the apartment 40 weeks a year which would pay the not, and pay for a European holiday every year. However, finding the place is the problem. We’ve looked at a few apartments and they were very small and pretty despressing. Gretchen then discovered the “Paticulier de Particulier” weekly real estate listings and through some research, we discovered some interesting facts about buying real estate in France. First of all, the only central listings are in the “Particulier de Particulier”. The realty offices only carry exclusive listings to them, so four realty offices in a four block area of the Marais all have different listings. Secondly, the realty offices tack on about 6% above the selling cost. Yes, over here, the buyer pays the commission. However, you can save the commission by buying directly from the owner. Here’s the catch though. When you see an apartment through the realtor, they make you sign a document that binds you to use them if you buy the apartment. We looked at 6 or 7 apartments. One was great, but had a 5 flight of stairs walkup and a heafty price tage. The others were small and dumpy. One, in the Village St Paul was barely 2 rooms (35 sq meters) with a hot plate in a 17 century restored building. We couldn’t believe they were asking 275,000 euros for it. Even with a mad search for realty property, we did manage to enjoy a lot of Paris. We walked through lots of great neighborhoods from the Marais, to the Luxemboug Gardens, to St Germain de Pres, to the Palais Royal, to the Champs Elysee, to the Bastille and back and forth through Beauborg and Les Halles. We had a couple of hours in the Louvre (not nearly enough). I had forgotten how BIG it is. The Palace takes up 6 long city blocks. And I forgot how many wonderful treasures live inside. Even in our speed tour, I got momentarily lost in the Ghirlandaio and Caravaggio paintings. We saw a few movies at the Parisian movie theatres, we dined on street sandwiches for lunch ate some plump oysters at Bofinger’s. And on our last night in the Marais we had dinner at Brasserie Camille on the Rue Francs Bourgoies. It is a little neighborhood brasserie and the meal was OK, but what was amazing was how many people smoke in Paris. In the crowded little dining room, we were surrounded on every side by smoke, and lots of it. The waiter asked us if we would like smoking or non-smoking. The non-smoking table he brought us to was in the center of the restaurant, barely 12 inches from the neighboring table where tobacco smokestacks were fuming. On the final morning, we waited for Monsieur Boufraine to pick us up at 9:30am and take us to the airport. At 9:30, no Boufraine. At 9:45, still no Boufraine. I tried calling his cell phone but kept on getting the recorded message. At 9:55 I called the taxi service, a voice prompt system that explained the cab would take 30 minutes to get to the apartment. At 10:00, Gretchen hit the street and luckily flagged down a cab. Still no sign of Boufraine. Oh well, one more adventure….